When Elizabeth Cady Stanton read these radical words in the mid 1800’s, she was booed and jeered for her sacrilegious editing of the Declaration of Independence. It was “sacrilege” on several levels: when the women’s movement disavowed the hierarchical status quo of the American culture of their day, they challenged the “sacred” foundational understandings of both men and women. Further, when they claimed that women should have an equal place within the home and the church and society, they argued against fundamental presuppositions of inequality within the religious establishment. It was not easy. Questioning the status quo brought significant vilification and persecution to these women. From the days when Elizabeth Cady Stanton, Susan B. Anthony and many bold women stood up for equality at the 1848 Woman’s Rights Convention, it still took America another 72 years to permit women to vote. The fine film, Iron Jawed Angels, remembers the time when Alice Paul and other second-generation suffragettes were jailed for their peaceful protests. Women’s suffrage finally became an American reality with the 19th Amendment to the Constitution in 1920. On the 94th anniversary of the 19th Amendment, whether we realize it or not, we stand on the shoulders of these good and rowdy women who refused to stay in their “place.” Today when women do not vote, we not only dishonor the life and work of our mothers, we also refuse to step into our proper place of living responsibly within our liberties. As a Christian minister, I know something about what it means for a woman to step “out of her place.” Countless women have been socialized to accept our culture’s definition of what is appropriate. Like fish in water, too many women are content to stay where they are instead of doing the hard work of defining our lives for ourselves; of evolving and becoming the whole, holistic human being God has created us to be. I am a preacher and am well aware I may be preaching to the choir, but as I have been doing voter registration in my East Texas county recently, I have met too many women who have never voted and do not plan to. Voting is just one way women can find our voice and speak our mind. Voting is one vital way women can grow up and live into our responsibilities as equal citizens. So if you know any women who need to be encouraged to get involved, please speak up. 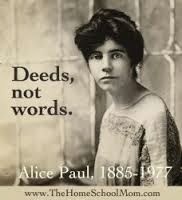 Tell the story again of Elizabeth Cady Stanton and Alice Paul. Tell your own story: why you care and why you vote. Because I am a Christian, I believe God created all humans with equal worth – therefore I choose to vote for Democrats because they more often than not share my vision of an equitable America. Because I am a Christian, I believe God calls each human to step up to our lives and work for “liberty and justice for all” – therefore I choose to work for liberal political solutions to the many inequities that still plague this land that I love. Because I am a woman, I believe I have something unique and precious to offer to the larger American conversation – therefore I choose to grow up and grow into the privilege of living as a responsible American. If we women would vote our values, advocate for just and equitable policies, canvas for candidates who share our values and take our turn leading in government at every level, we could – like the women who have gone before us – change the course of American history. Charlotte Vaughan Coyle is an ordained minister within the Christian Church (Disciples of Christ) and a doctoral student at Brite Divinity School in Ft. Worth.